Taliban Flees Marjah, Threat Remains For Marines In Southern Afghanistan U.S. Marines and their Afghan counterparts are tightening their hold on the Taliban stronghold of Marjah, in southern Afghanistan. But hundreds of deadly homemade bombs, or IEDs, remain behind. 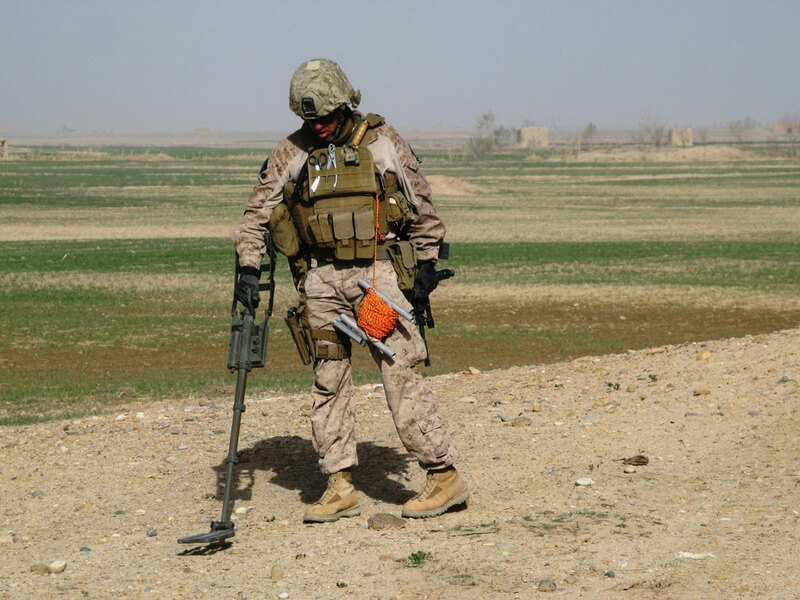 A Marine sweeps for mines in the Taliban stronghold of Marjah. In southern Afghanistan, U.S. Marines and their Afghan counterparts are tightening their hold on the Taliban stronghold of Marjah. Each day, troops are uncovering weapons caches left behind by Taliban fighters who ran away or are hiding among the local population. But even with the militants' departure, a major threat to troops and local civilians remains — homemade bombs known as IEDs. Hundreds of them were planted across the 70 square miles of the Marjah district in the months leading up to the American-led offensive launched in mid-February. India Company of the 3rd Battalion, 6th Marine Regiment has spent most of its waking hours dealing with IEDs, improvised explosive devices. We can see the guys shooting at us, but we can't see the stuff in the ground. We have dogs and metal detectors, both great assets. Sometimes it's luck. On a recent afternoon, the Marines detonate 400 pounds of IEDs they uncovered on a bridge on the approach to northwestern Marjah. The "daisy chain" of bombs could have killed and maimed many troops if the convoy of vehicles had driven across them. A Marine team detonated the homemade bombs in a controlled explosion. The only casualties were a dozen doors on abandoned stores that were blown off their hinges. Capt. Bill Hefty commands India Company, which discovered the bombs and captured the militant holding the detonator. "I wasn't shocked there were IEDs, but I was a little shocked they were completely set up for us to come north to south, straight up the middle. I would have thought they would have thought I was a little smarter than that," Hefty says. Outsmarting the Taliban in hopes of avoiding the deadly bombs is a full-time job for Hefty and his team. So is the hunt to find all of the IEDs in areas where the Marines and Afghan soldiers are forced to tread, says 1st Lt. Justin Gray, 27, from Atlanta. Every day, Marines uncover weapons caches left behind by Taliban fighters who ran away or are hiding among the local population. 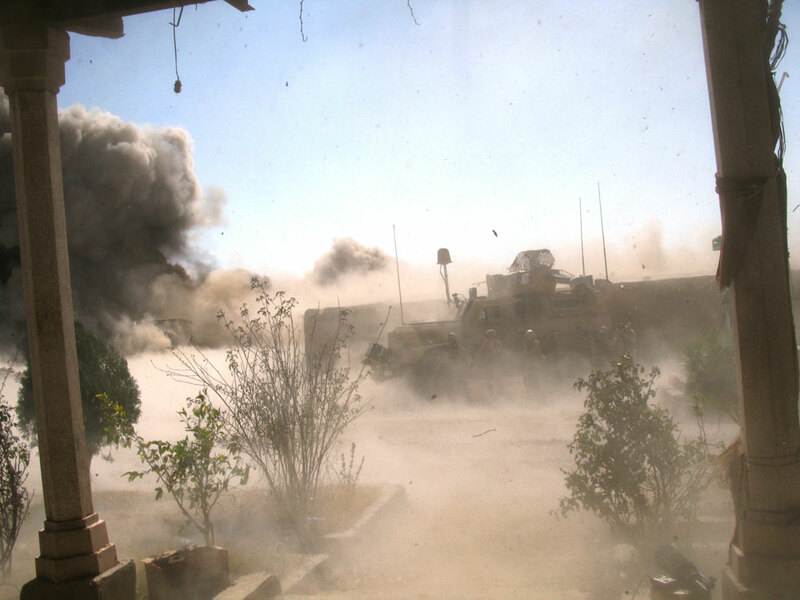 Here, the explosion after a team detonates 400 pounds of IEDs found next to its temporary command center. "We can see the guys shooting at us, but we can't see the stuff in the ground. We have dogs and metal detectors, both great assets. Sometimes it's luck. But yes, the IEDs are the greater threat. It's harder to counter those than to counter small-arms fire," Gray says. In the first three days of the offensive, Gray's men uncovered nearly 20 IEDs in a tiny village they captured from the Taliban. But there were a few they missed. On a recent patrol, a Marine warns the others: "Hey, listen up — everybody has got to push back that way." An explosives team found two IEDs outside the gas station where they spent the night. A team takes care of the matter, destroying the bombs in a controlled explosion. "It was about 60 pounds. It's probably an ammonium nitrate, aluminum powder mixture, which is what they've been using so far. And it provides a blasting cap of some sort. And a pressure plate with a power source," says Gunnery Sgt. E.J. Pate from Mullins, S.C.
Later that morning, Staff Sgt. David Southerland of Carbondale, Ill., takes another group of explosives experts and combat engineers to clear a road so they can start moving troops and supplies. "There is always some bit of worry," Southerland says when asked if he's nervous on such missions. "But I feel that we are trained well enough to prepare for it, so ... it is what it is. We are here to do — to save lives and help people out." 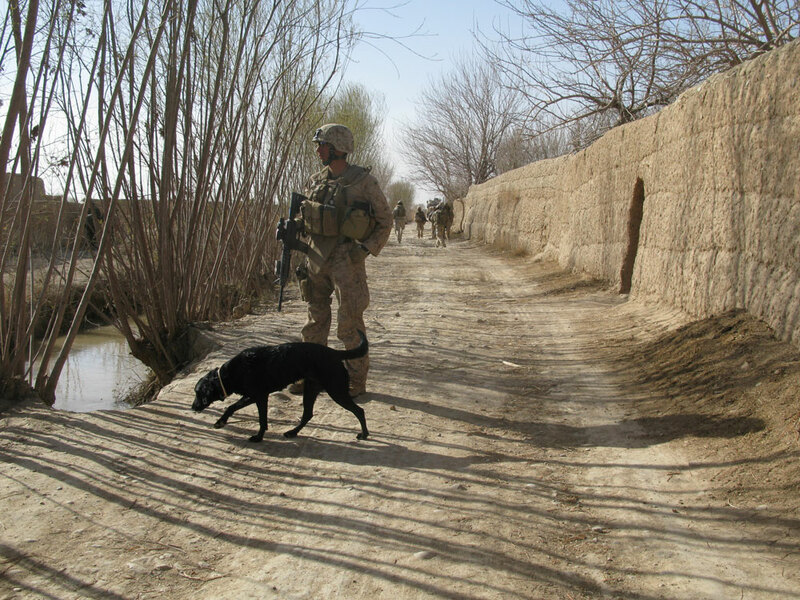 Sally, a bomb-sniffing dog, assists Marines in the search for IEDs during their offensive in Marjah, a Taliban-infested area of southern Afghanistan. Southerland and two other explosives experts slowly wave hand-held metal detectors over the dirt road and across nooks and crannies in nearby mud walls. When they get a solid reading, the combat engineers with them spring into action. They use their knives to dig into the dirt in search of a pressure plate or wire. Sometimes, they gently kick at a suspected spot with their boots. Most of the time, the digging and kicking reveal it is a false alarm. Juice containers, bullet casings — even single servings of instant coffee in aluminum wrappers — set off the minesweepers. But the good news, Southerland says, is their thorough search means they can clear this stretch of road. He decides to spot-check an area nearby that was briefly swept by another patrol. Sometimes, details are overlooked. It turns out to be the right call. Southerland finds an IED, and his team destroys it. The staff sergeant says what tipped him off to the IED were two larger stones he spotted nearby, one on top of the other. The stones were a warning from the Taliban to local Marjah residents not to tread there.